Gus and Echo, 7 month old males. 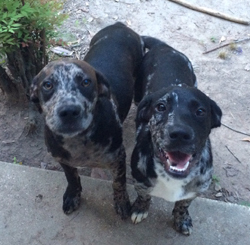 Catahoula/Lab mix. Good with people. Need a new home ASAP. Owner is moving and can’t take them with her. If interested please call 870-740-4127. This entry was posted on Thursday, July 28th, 2016 at 12:14 am	and is filed under Classifieds. You can follow any responses to this entry through the RSS 2.0 feed. You can leave a response, or trackback from your own site.